Today in the main trading session the AUD/CHF had a visual sell alert on The Forex Heatmap®. The heatmap showed consistent AUD (Australian Dollar) weakness on all pairs, which drove intra-day price movement. 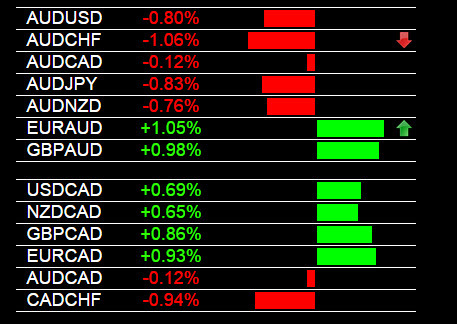 There was also some EUR strength and CHF strength in the market. The EUR/AUD rose and the AUD/CHF dropped. These pairs are not trending, they are ranging on the smaller time frames, therefore we would scale out lots on these short term trades. The heatmap trading alerts are visual alerts for 28 pairs. Today in the forex market the Australian Dollar (AUD) was weak on all pairs. This drove strong price movement for forex traders. There was also some British Pound (GBP) strength and minor Swiss Franc (CHF) strength in the market as well. This drove the GBP/AUD higher and the AUD/CHF lower. The movements were strong but both pairs are ranging inside of support and resistance, so we would scale out lots on either trade. The AUD weakness you see below is shown on The Forex Heatmap®, which gives live buy and sell signals for 28 pairs including the AUD pairs. Today in currency trading The Forex Heatmap® signaled a buy on the EUR/AUD. The Australian Dollar (AUD) was weak on all pairs, and the market also had some Euro (EUR) strength and Swiss Franc (CHF) strength. This drove the movement and trading cycles on the AUD/CHF and EUR/AUD. These movements were against the major trends of the market but were very good short term movements for intra-day trading. The trading signal system you see below is The Forex Heatmap®, which provides live signals for the AUD pairs and seven other currency groups. 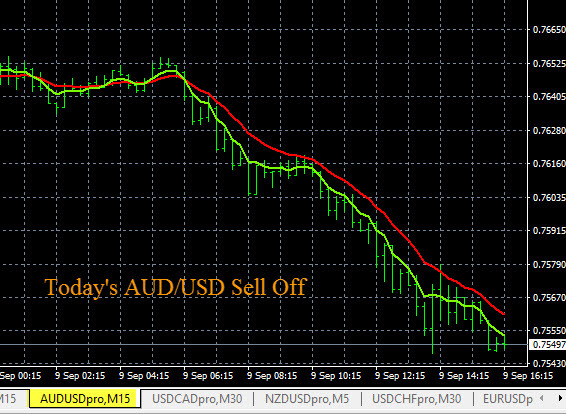 Today in forex trading the AUD/NZD had a sell signal on The Forex Heatmap®. The Australian Dollar (AUD) started to weaken in the Asian session after the AUD employment report news. There was also some New Zealand Dollar (NZD) strength in the main session today, which drove this pair lower. The AUD/NZD is currently trading at the 1.0925 support level, we suggest taking some profit at this support level. The signal system you see below is The Forex Heatmap®, which is a visual map and indicator system for the forex market, it provides live buy and sell signals for 28 pairs. Today in forex trading the the AUD (Australian Dollar) was weak on all pairs. This weakness started after the CPI news drivers were announced. Many of the AUD pairs had strong movements, however due to the amount of AUD strength in the overall market trends we suggest profit taking. At some point we would expect these pairs to reverse, so we consider the movements today to be short term. Pairs like the AUD/CHF and EUR/AUD may continue moving one more day before stalling at support and resistance, respectively. The live trading signals you see below are from The Forex Heatmap®. Today in forex trading the Australian Dollar (AUD) was weak on all pairs. There was also some Swiss Franc (CHF) strength in the market. This drove the AUD/CHF to near eight week lows. The Euro (EUR) strength in the market also drove the EUR/AUD upward past all recent resistance to new breakout levels. The EUR/AUD is trending on all of the higher time frames and should continue higher. The live forex signal system you see below is the Forex Heatmap®, which provides trading signals for 28 pairs and eight currency groups.